Hi, and welcome to another issue of Learn Hot English – the fun magazine for learning English. Do you know how to negotiate in English? It’s a useful skill that could save you money and help you progress in your job or in life in general. We’ll be looking at some useful language for making and responding to proposals. Listen to the conversations and really improve your listening and communication skills. Of course, that’s not all, and we’ll also be looking at Oxford, author Lewis Carroll, drinks, the phone, teambuilding, famous film scenes, Alice in Wonderland, how to haggle, the Dutch English accent and lots, lots more! 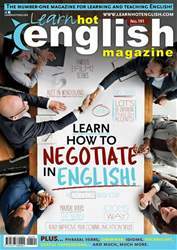 Well, we hope you enjoy reading and listening to this issue of Learn Hot English. Have fun, learn lots of English and see you all next month!